Every year at the holidays, I look forward to receving Holiday Cards in the mail from family and friends. I love everyone’s unique style when choosing a card, and it is so much fun seeing everyone’s children and families growing. The cards instantly become part of my holiday decor as I proudly display my cards on gorgeous elastic holiday bows that stretch around my doors in my living room; the cards hang with mini red clothespins. Family and friends cannot help but browse and read each beautiful card that hangs on pretty holiday ribbon card holders throughout my dining room. As much as I love receiving the cards, creating them is just as much fun. One of my favorite places to do so is at Tiny Prints. Tiny Prints cards are made of thick, high quality cardstock and the designs are endless. One of my most difficult tasks each year is choosing the perfect card from the hundreds of beautiful and festive choices. Every year new designs are added, leaving choices fresh and exciting year after year. I love that Tiny Prints offers so many styles to fit everyone. You’ll find everything from traditional colors and embellishments to modern and unique color choices and designs. They even have ornament cards that you can hang from your tree! Best of all, each style of card on their site has a little “heart” button below it that you can click to store your favorites as you browse. I love this feature! Are you looking forward to ordering your holiday cards as much as I am? If so, you will want to check out my awesome giveaway from Tiny Prints. One lucky Delco Deal Diva reader will win $50 towards your order (does not include shipping and cannot be combined with other promo codes). Simply enter via the easy Rafflecopter form below. Winner will be selected on November 17th. Special Offers page for awesome coupon codes guaranteed to save you money! Disclosure: In exchange for this post, I will be receiving a gift code from Tiny Prints to use toward my photo card order. I received no further compensation. Opinions, as always, are 100% mine. I like the circle ornament one! I like the round Christmas ball ones and also the pinstripes! I used TP for holy communion invites and lived them. I like their handwritten love card! Very original! Love these. 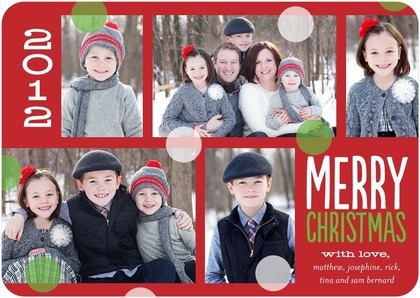 We are going to try this weekend to take our own pictures and order cards from Tiny Prints/Shutterfly. Saw this idea for a cute backdrop. I have a neighbor that is letting me borrow her camera so I hope it works out! That’s awesome! Can’t wait to see them Lisa! Missed you at Maddox’s party!! I like the Festive Delivery: Khaki . I like the one called Handwritten Love. I love the Sweet Winter card design! I love, love, love the ornament cards! Has a winner been picked yet?